This article introduces how many kinds of assets that can insert to a scene and how to insert them to the scene. The asset which can import to the scene are 3D Model, Image, Music, Video and PDF. The asset stands for one of the element in the scene. 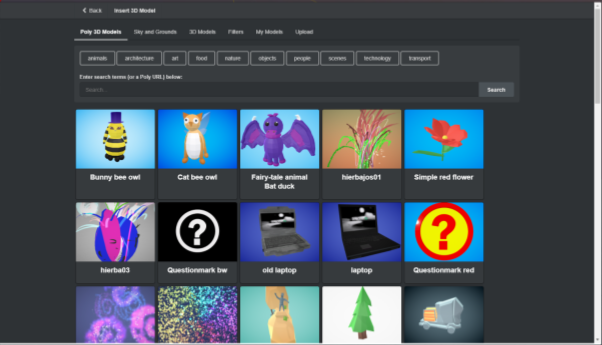 In the 3D Model menu, you can insert 3D objects, Skybox, Directional Light, Ground ,Particles, applying a filter and uploading 3D objects or assets which are made by Unity to the scene. 3D Model is divided 6 categories. We will introduce them each categories in order. 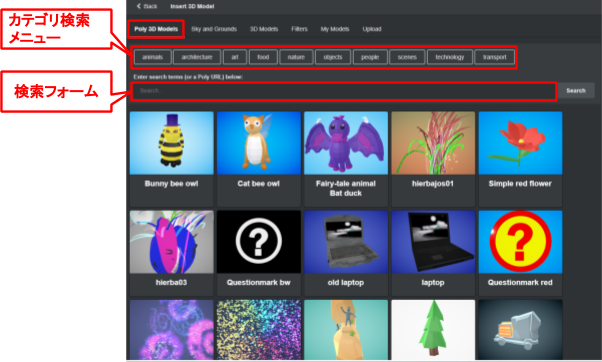 In the Poly 3D Models, you can search 3D objects of the Google Poly and insert them to the scene. Also, you can narrow down categories at category search menu. In the search form, you can search the 3D objects by inputting keywords or an URL. 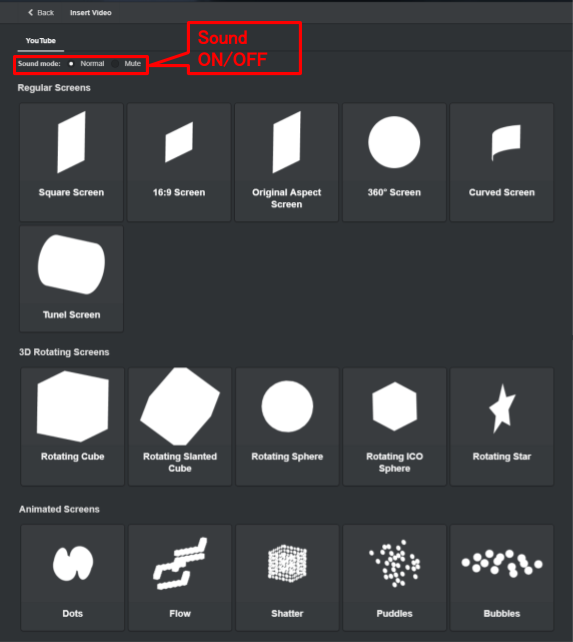 Look at below to get how to get the URL of 3D objects from the Google Poly. Access to the Google Poly and search the 3D object. Click a share button and copy an URL. Or, copy the URL of a browser. Paste the copied URL to the search form. Next, click a [Search] button. Then, you can insert the 3D objects that you searched from the Google Poly to the scene. In the Sky and Grounds, there are many assets as a basis. You can insert the DirectionalLight, the Skybox and Ground. The DirectionalLight is a light which lights up the scene like the sun. Insert the DirectionalLight to the scene if you feel dark. The Skybox is a sphere which cover the whole scene. By changing the Skybox, you can change the atmosphere of the scene. The Ground is a floor/ground. Change the Ground after changing the Skybox. Then, a basis of the scene will be completed. In the 3D Models, you can insert particles and default assets in the STYLY to the scene. 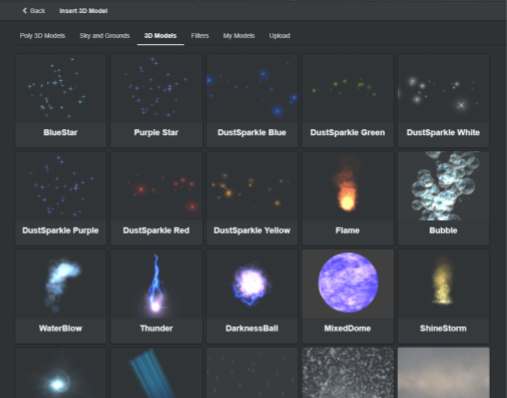 There are many particles like lights, flame, thunder, snow and many assets like, plants, clothes, furniture, animals and building. In the Filters, you can apply a filter to the scene. There are 10 kinds of filters, Cool, Night and Heaven and so on. You can create an art scene. By using PostEffect_DayTime_Psychedlic, I edited the scene psychedelically. 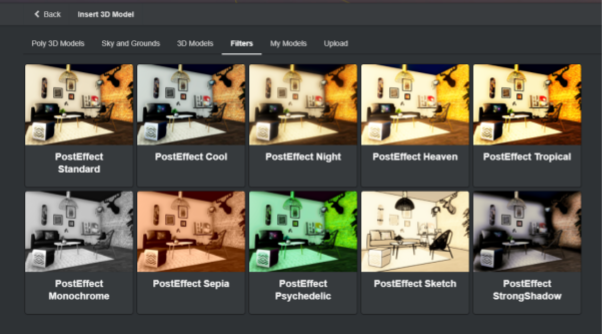 By doing this way, you can edit various effects. 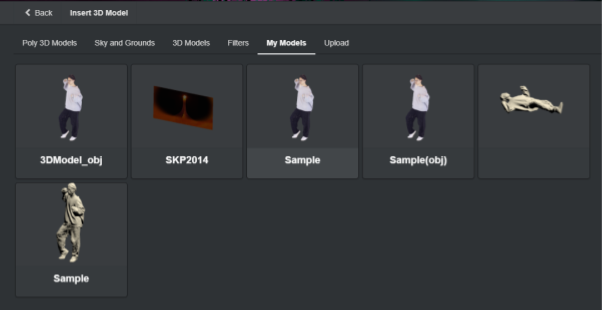 In the Upload, you can upload 3D objects to the scene. Uploadable date files are below. We will introduce how to upload OBJ/MTL/JPEG files. 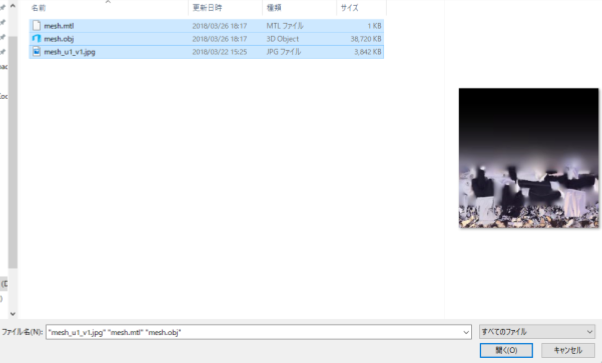 Other files can be uploaded in the same way. Select the OBJ file, MTL file and JPEG file. It requires to upload one by one. Multiple uploaded are not corresponding. Input a file name to a form of upload file name and click an [Upload] button. You can check the state of uploading and detail about the state is below. It will be uploaded when the state become “Completed”. Under uploading, you can check the latest state by clicking a button(Status更新ボタン). Uploaded date can be selected from a My Models. Uploaded 3D objects are appeared in the My Models and you can place them to the scene. In the Image, you can insert images. Image format are PNG and JPEG. Also, there are several kinds of screens in the Image. 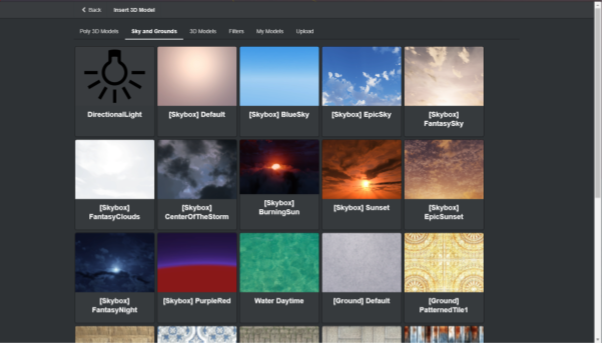 You can use images like Skybox and make them move in the scene. Then, we will introduce how to upload images. Select a photo(JPG file or PNG file). 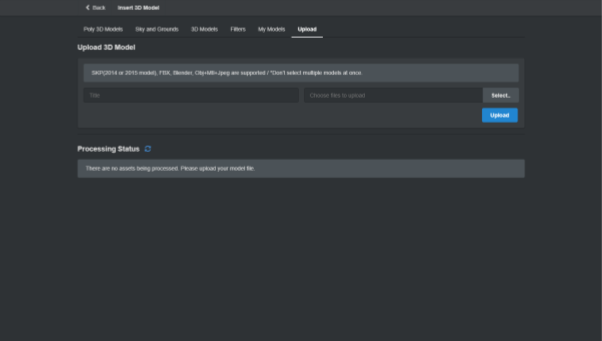 Click a [Next] button after uploading was completed. Select a screen which you want to display. We will introduce each screens. In a Regular Screens, there are a screen which is changed the size ratio, a reshaped screen and a 360° screen. 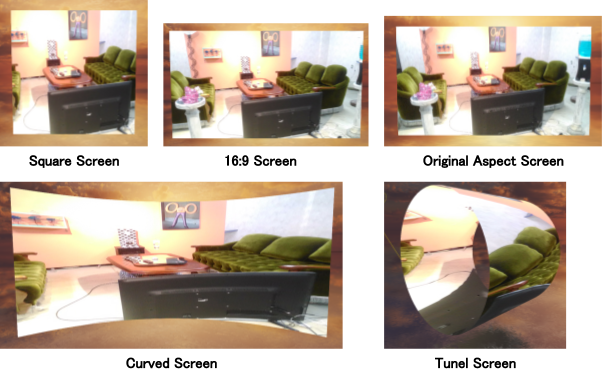 A 3D Rotating Screens is a screen which is animated and three-dimensional shape. By using a 360°Screen, you can insert the image like the Skybox as a sphere. Rotating Cube：A rotating screen which is shaped square. An uploaded photo is pasted on the surface. Rotating Slanted：A rotating screen which is shaped slanted square. An uploaded photo is pasted on the surface. Rotating Sphere：A rotating screen which is shaped sphere. An uploaded photo is pasted on the surface. Rotating ICO Sphere：A rotating screen which is shaped ICO sphere. An uploaded photo is pasted on the surface. 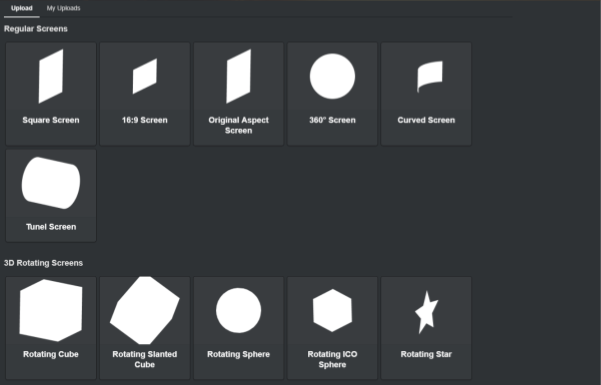 Rotating Star：A rotating screen which is shaped star. An uploaded photo is pasted on the surface. Only you place some photos, illustrations and pictures on the scene, you can hold an exhibition in a VR space. In the Instagram, you can insert photos to the scene by cooperating with an instagram account. There are screens for pasting photos. We will introduce how to insert the instagram photos. Click a [Authorize with Instagram] button. 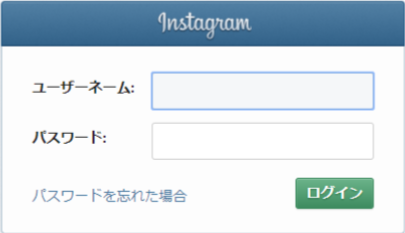 Login page of the instagram will appear. Input an username/a password and click a [ログイン] button. Select an animation screen for pasting photos from the instagram. We will introduce several kinds of the animation screen. Instagram Dots is a frame which is rotating and changing the number of dot shaped frames. 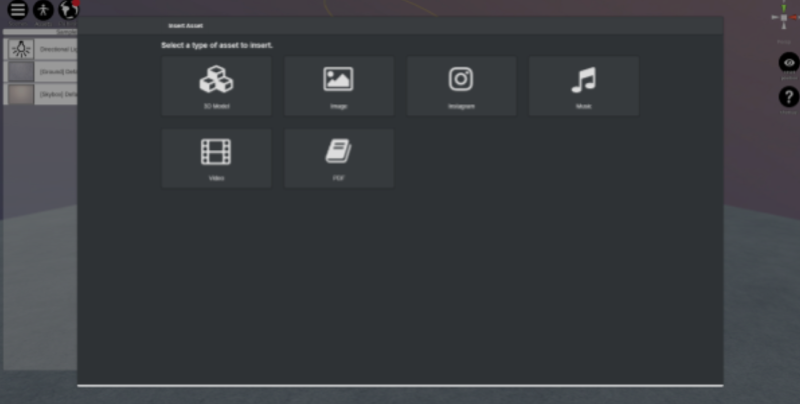 Flow animation screen is a frame which is animating randomly with squares. Instagram Shatter is a frame which is made of dots frames like exploding. Instagram Puddles is a frame which appear randomly. Instagram Bubbles is a sphere shaped frame which is fade out while appearing down to up. The instagram photos will get the latest information when you use the VR mode and past them to the animation frame in order. The number of photos in the scene will be changed by animation frame. 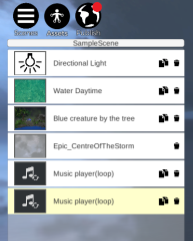 In the Music, you can insert a music. You can insert a MP3 format file and from SoundCloud. It is the music is one of the most important factor in the VR space. We will introduce how to insert a music. We will introduce how to insert a MP3 file. Click a [Select..] button. After uploading, click a [Next] button. 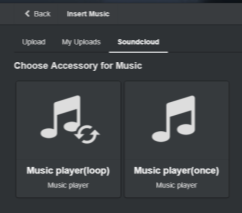 Select a Music player(loop), if you want to loop the music. 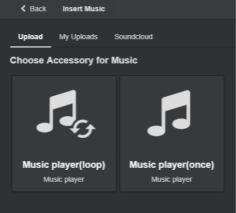 Select a Music player(once), if you don’t want to loop the music. Once you uploaded a file, all files are preserved in My Uploads. We will introduce how to insert a music from the SoundCloud. Input a keyword to a search form and click a [Search] button. Then, the result will appear. Click a [Insert this track] button if you want to insert the music. Click a [Play] button if you want to listen to the music. The SoundCloud page will appear. If you want to insert multiple musics to a scene. You can insert multiple musics to the scene, but all musics will be played at once. By clicking a thumbnail button for “invisible setting”, you can turn off the other musics. In the Video, you can insert Youtube videos to the scene. We will introduce how to insert it. 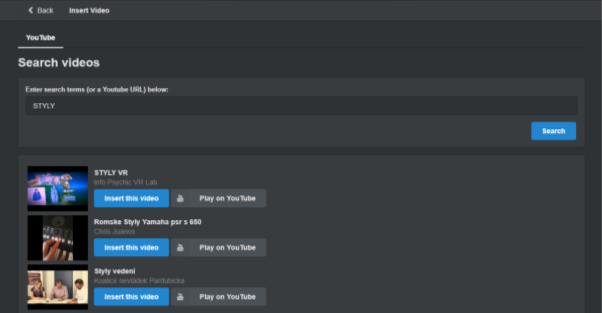 Input a keyword or an URL of Youtube to the search form and click a [Search] button. If you see a message “Prohibited video. Can not use in STYLY” after searching the URL of Youtube, you can’t use the video because the creators don’t give an admission to reuse the video. List of the search result will appear. You can insert videos by clicking an [Insert this video] button. Youtube will appear when you click a [Play on YouTube] button. In the Sound mode, you can select Normal(ON) or Mute(OFF). Next, select a screen. The kinds of screens are the regular screen with no animation, the 3D rotation screen/ animation screen with animation. In the PDF, you can insert PDF files. When you insert PDF files, it will appear like a book. 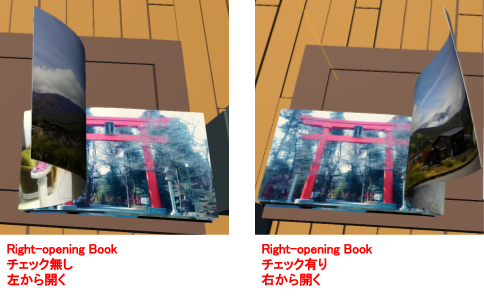 You can create a magazine, a catalog, a manga and a photo album in the VR space. We will introduce how to insert PDF files. If you want to open a book(PDF) file from left side, don’t make a check in a check box of the Right-opening Book. If you want to open a book(PDF) file from right side, make a check in a check box of the Right-opening Book. Then, click an [Upload] button. The PDF file was inserted. You can browse pages by using [←][→] keys on the WebEditor. That’s all. We introduced how many kinds of assets and how to insert the asset can import to the scene.